First of all, I would like to apologize for a very long break in posting on the blog. In particular, my opponent from game 2, Tristan. Hopefully he will still enjoy it and recalling all the interesting moments! Tristan brought the army of Elves as well so we were about to fight a civil war! In addition, the composition of his force was significantly different and that alone ensured a very interesting match up. However, Tristan also brought Green Lady and upgraded some of his units to the Formation: Honor Guard of the Green Lady. While I have had already a chance to play against this particular Living Legend Hero, I have never played against such Elven formation. I was very curious how it would affect the game play! 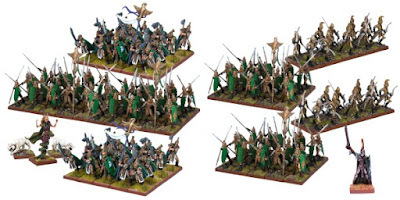 I would like to call this army a classic Elven style force. There is a horde of Archers to form the core of ranged attacks elements, with the support of Silver Breeze and Bolt Thrower. This amount of firepower was already dangerous, in particular for my smaller regiments and troops. There was a horde of Tallspears to hold the enemy and two regiments of Palace Guard to hit was pinned by Spears. Storm Wind cavalry was strong enough to charge enemies on its own but could also rely on very dangerous Dragon Kindred Lord. He could either join forces, even in a frontal assault or maneuver patiently while adding to the ranged attacks potential. The magical support of three spell casters was very versatile too. Last but not least, the formation upgrade gave Tallspears and Palace Guard regiment much needed resilience in the form of Regeneration (5+). In this case Tristan's army had a clear advantage in the war of attrition. 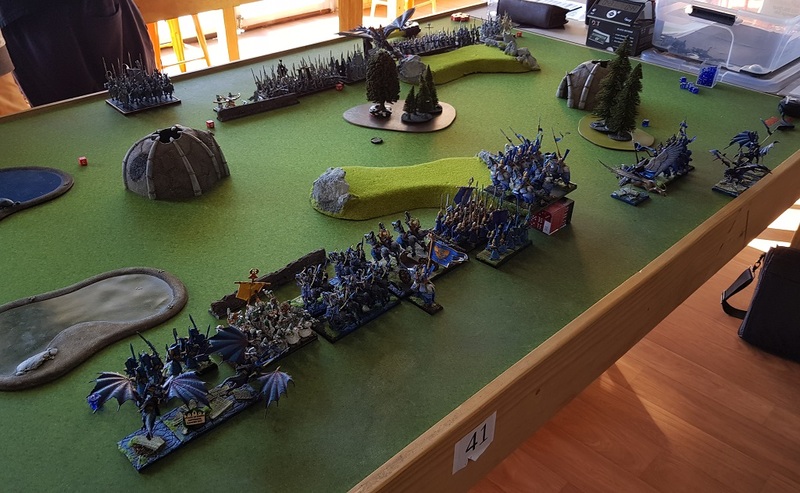 His army also had a fire power that I had to quickly deal with in order to protect my units. I thought I may have a bit of an edge in terms of maneuverability but that posed a challenge in itself. On one hand I wanted to buy as much time as possible to get around enemy units to launch the combined charges. Especially against units with Regeneration. On the other hand I needed to close distance with the shooter quickly in order to prevent them from damaging my army. The plan, thus was to use speed and small advantage in numbers to get either Drakon Lord or Mounted Prince into Archers Horde. That would at least distract the unit. If possible I would have second wave ready to take on them too. The rest of the army would be maneuvering in order to stay out of range of attack and to try and surround the foe. In this game we played Eliminate as a scenario. That imposed further limitations on my plan because the units that hit the hardest in my force were also those that carried bounty tokens. Namely, Drakon Riders and Storm Wind cavalry. At the same time, Tallspears, Archers and Dragon Kindred Lord were much better at surviving the melee or staying out of it. Hence, the update to the plan was as follows. I would still need to distract Archers so the Prince and the Drakon Lord had their eyes on that target. I could still move around enemy units to pose a threat but I would definitely need to be much more patient and careful. 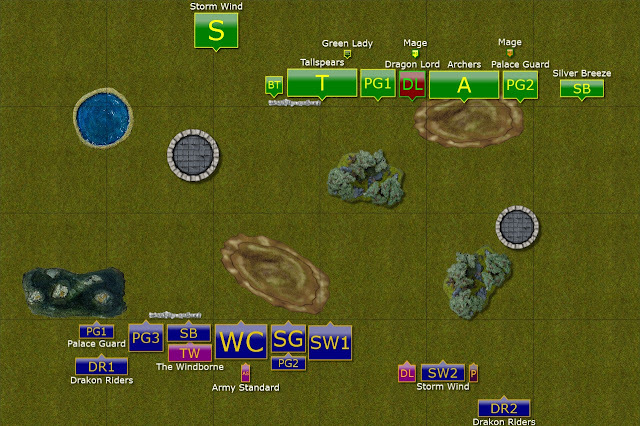 Finally, as there was a central objective to be controlled, I thought having Windborne cavalry with me would help. If I could keep my bounty carrying units alive and then Windblast the enemy away from the center, perhaps I could win the game by controlling the middle of the battle field. Tristan had the first turn. Tallspears lead toward the central objective. The Honor Guard of Green Lady moved forward against their rebellious Kin in perfect formations. Archers occupied nearby hill for a better overview of the battle field so only Bolt Thrower crew was able to shoot immediately. The battle has begun. Drakon Lord and mounted Prince used the cover of the nearby forest to close the distance to the enemy. The Drakons maneuvered to be ready to intercept Drakon Kindred Lord of he decided to attack the cavalry in the woods. 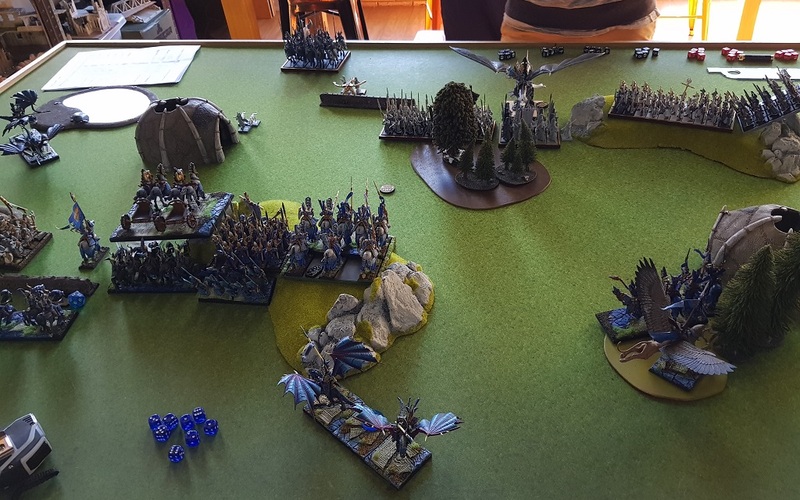 In the meantime, the rest of the army advanced towards the center and only Drakon Rider on the far left moved at full speed. Getting back to the forest. 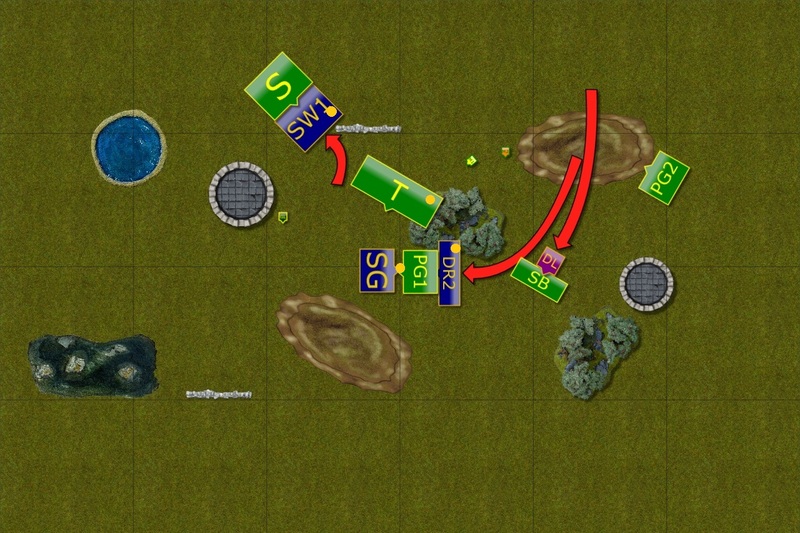 Elves advance towards the center objective. 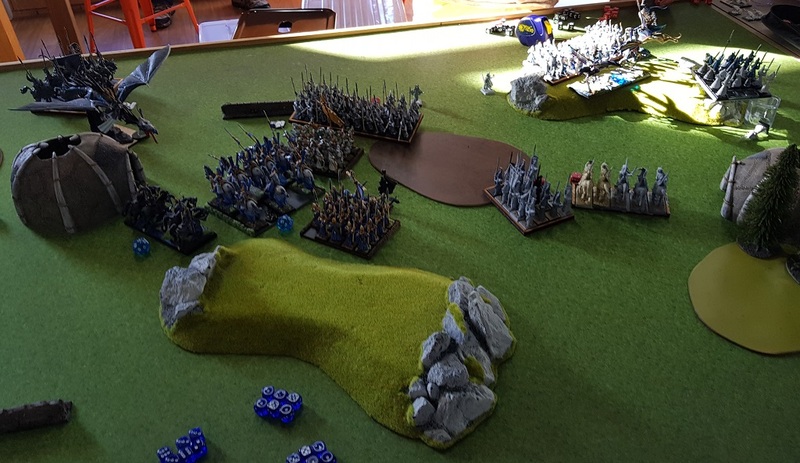 Tallspears and Palace Guard moved forward towards the objective in the center, trying not to expose any flanks for the enemy attacks. Dragon Lord steered towards the flank, to reinforce the heavy cavalry that could not outmaneuver Drakon Riders on its own. Consolidating positions on the center-left. And high speed maneuvers on the right. Chariots charge to distract the enemy. The Outcasts changed the direction on advance and moved fast on the right flank. 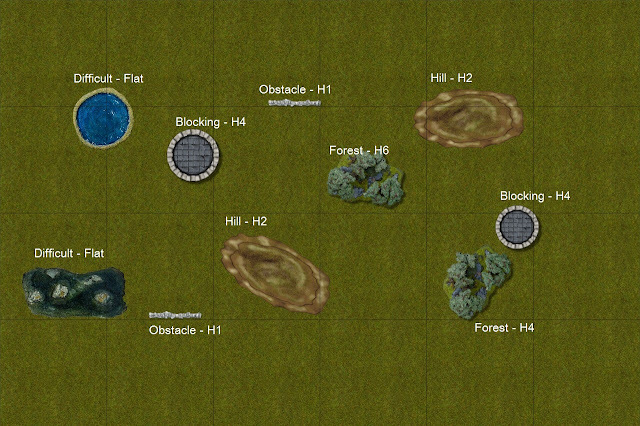 The units used the protection of the terrain and prepared to outflank the enemy formation. 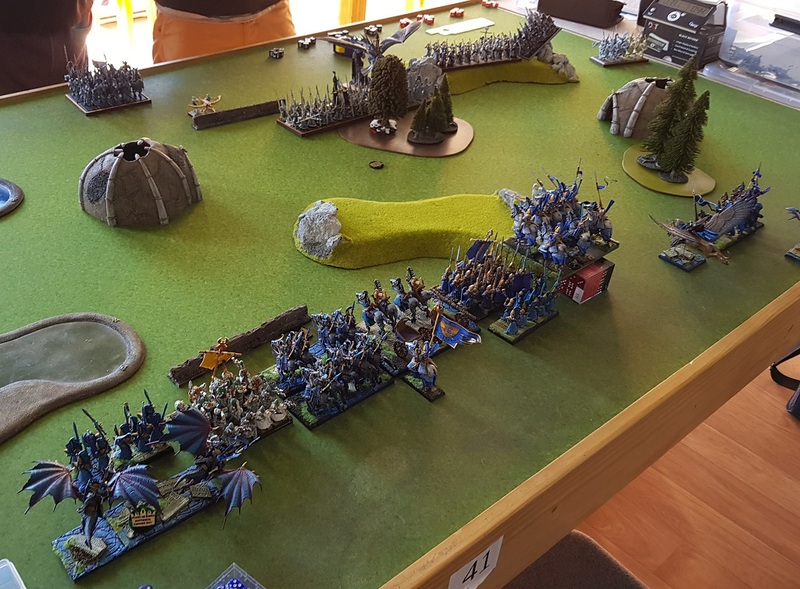 On the opposite flank the Drakon Riders continued tempting the enemy knights to abandon their defensive position. While the Chariots charged the Bolt Thrower in an attempt to distract the enemy. Unfortunately, the powerful Wind Blast pushed Tallspears back. While it was desirable from the point of view of who is going to control the objective, it had an unwanted side effect. Suddenly, the Chariots had their flank exposed to a horde of infantry armed with a lot of pointy sticks! Chariots pay the ultimate price. As expected, Tallspears and Dragon Lord did not give a chance for the Chariots to stay intact. The victorious units reformed and redressed the battle line. The remaining units also re-adjusted the positions to intercept outflanking forces. The Outcasts strike on the right. 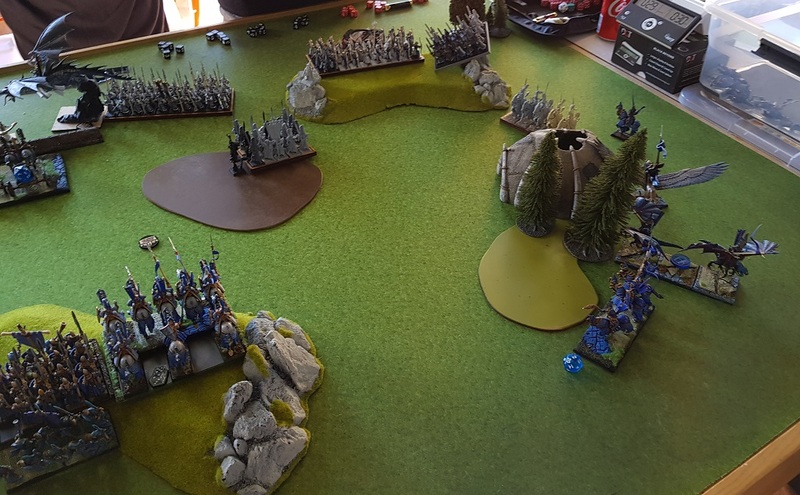 The Palace Guard moved on the left flank in the obvious attempt to trap the knights as the nearby Drakon Riders waited to counter attack. 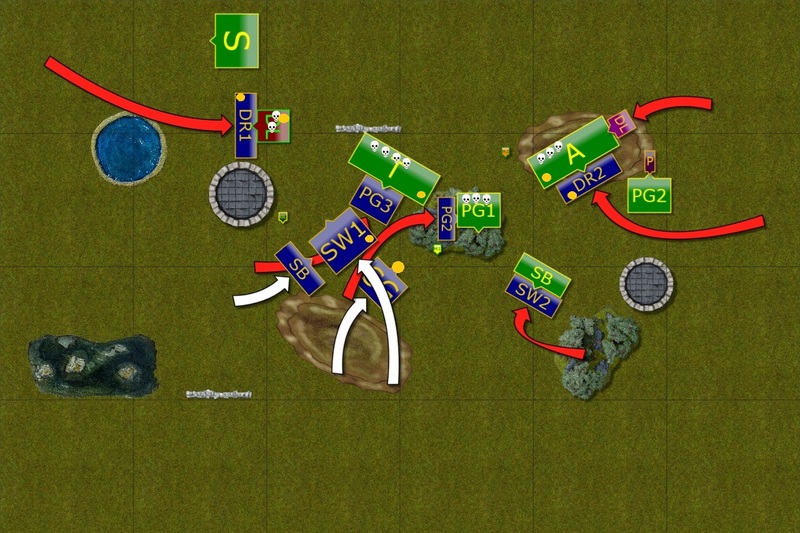 Units in the middle consolidated too and closed their distance to the enemy. 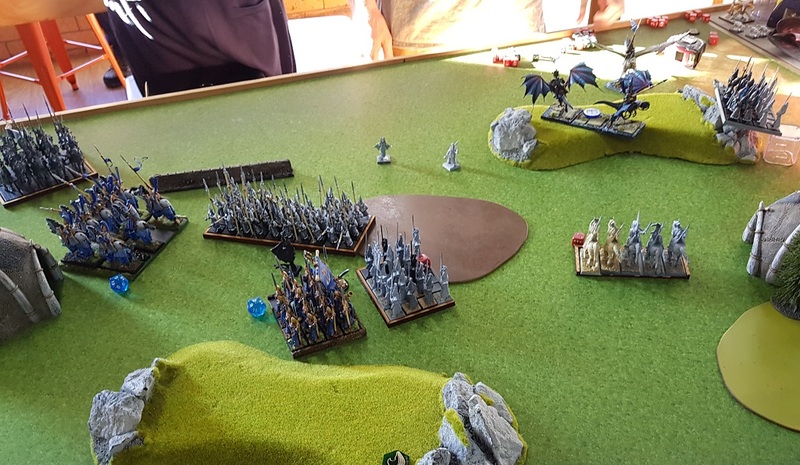 While on the right flank, the Prince charged the Archers to distract them and allow Drakon Riders and the Lord to land in preparation for combined attack. More loses for the Outcasts. 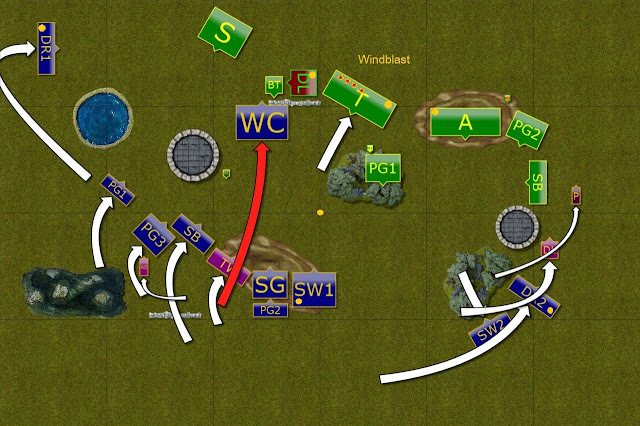 Overlooked Silver Breeze cavalry moved to the perfect position and aimed at Windborne cavalry. The shots hit the target and Legendary unit had no other choice but to disperse and regroup. They did not participate in the battle any more! Also Palace Guard unit paid for its folly. The Dragon Lord landed nearby and arrogant swordmasters were soon engulfed in flames. 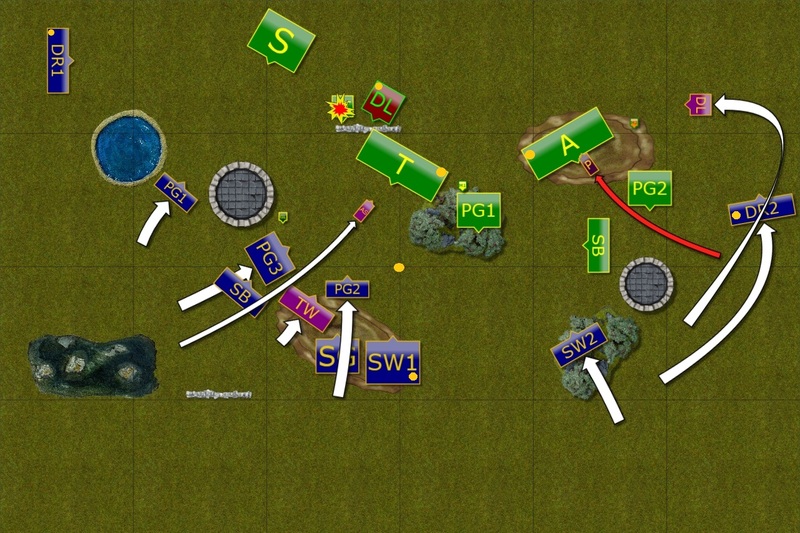 Attacks across the entire battle field. It was time for Outcasts to make the move and launch the attacks. 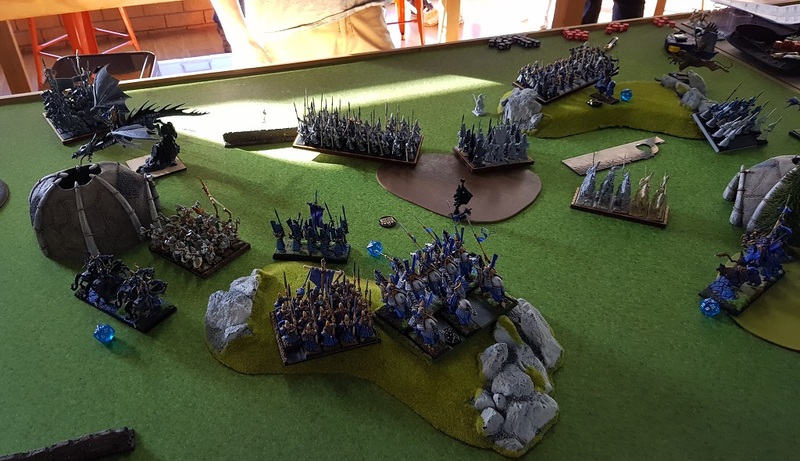 On the right flank the Drakon Riders and their Lord both charged the Archers. They held their ground but it was clear they may not survive the second punch. Storm Wind cavalry attacked exposed Silver Breeze fast unit but somehow they held too! 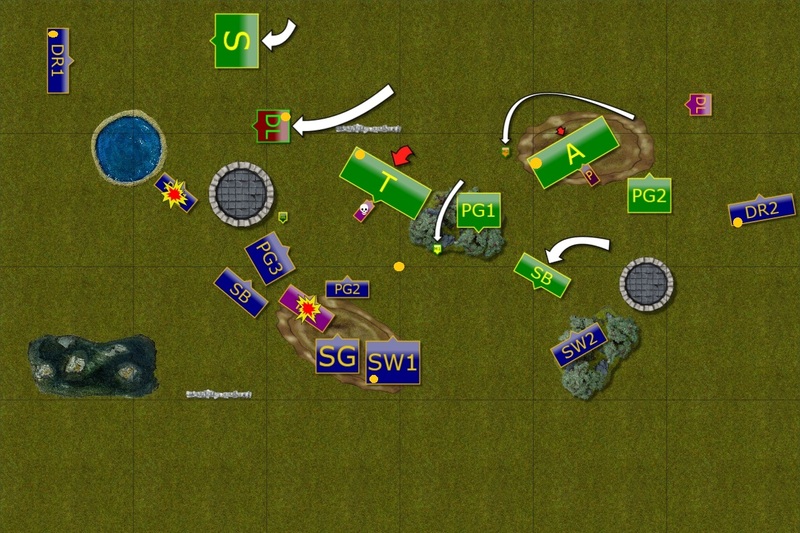 In the center, Palace Guard units attacked their enemies to pin them down, although the flank attack against elite infantry regiment had a chance to defeat the foe. Unfortunately for the Outcasts it did not happen. 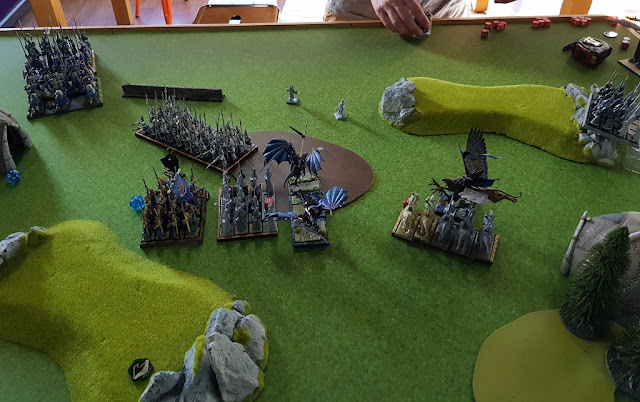 Finally, Drakon Riders charged the Dragon Lord to distract him so that Storm Wind regiment could have a clear line for a flank attack soon after. Provided they survived the counter charge. More losses for the Outcasts. Elves counter attacked their rebellious kin and were quite successful. 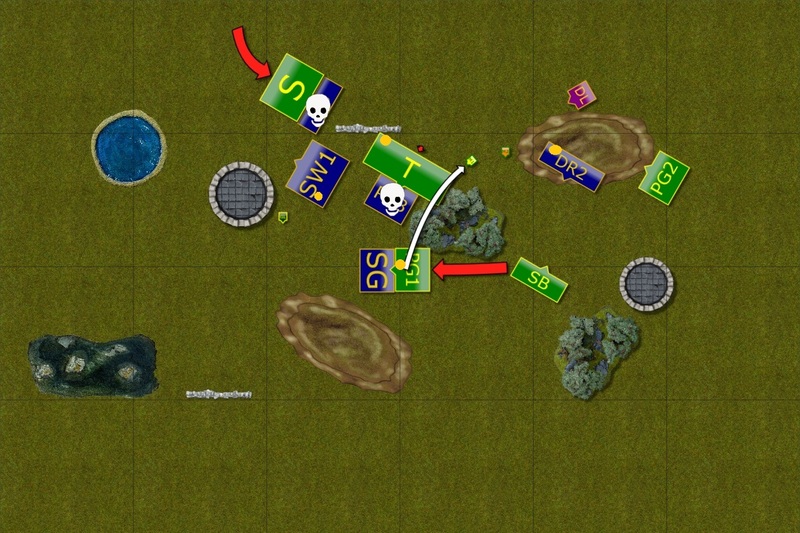 First, Storm Wind troop received a flank charge and simply was not able to withstand such an attack. Second, Palace Guard troop was simply blasted by magic. And third, Dragon Lord scattered Drakon Riders to the four winds! Fight for the center continues. Finally some successes for the Outcasts! Despite the losses, the Outcasts were in good position to execute second wave of the attacks. This time with much needed successes. On the right flank the Drakon Riders and the Drakon Lord managed to rout the Archers and claim the bounty. 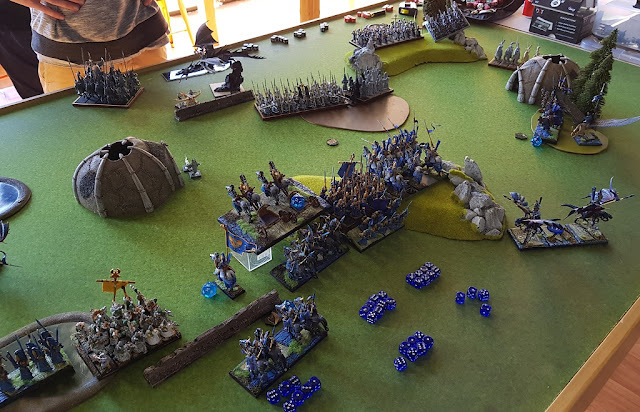 On the left flank, Storm Wind cavalry charged wounded Dragon Lord and defeated him too! The balance tipped towards the Outcasts' favor. Elves keep pushing towards the center. The Outcasts run out of the units! 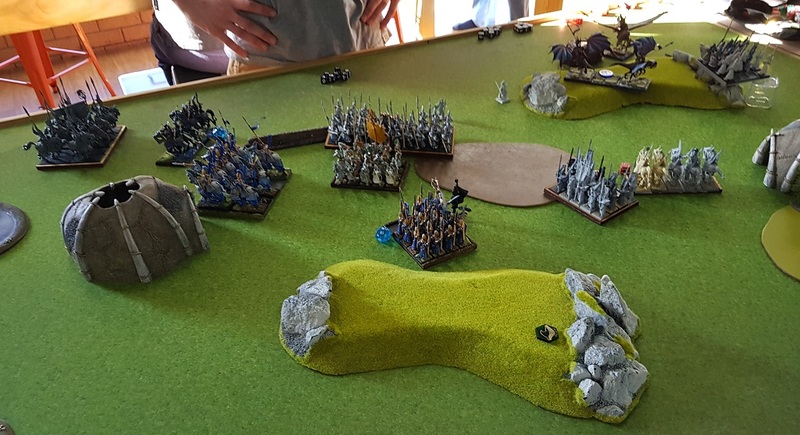 Elves continued their relentless march towards the objective in the middle. 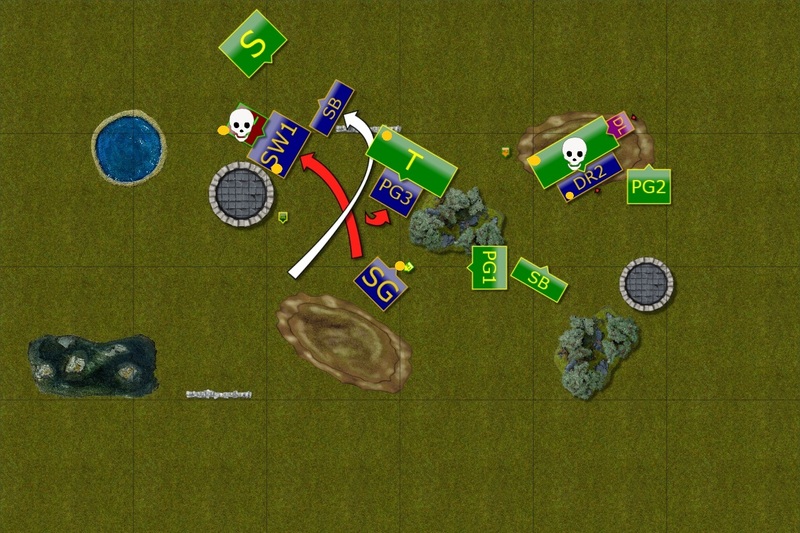 Tallspears routed enemy infantry, while Palace Guard clashed with the Sea Guard. The Outcasts had one more attempt to shift the balance into their own favor. The last attack is unsuccessful. The Outcasts had an option to either attack Tallspears or Palace Guard with a good chance for success. They needed to eliminate either in order to at least contest the control over the objective. But it would give them the victory. The decision was made to charge Palace Guard as the unit that potentially should be easier to rout. 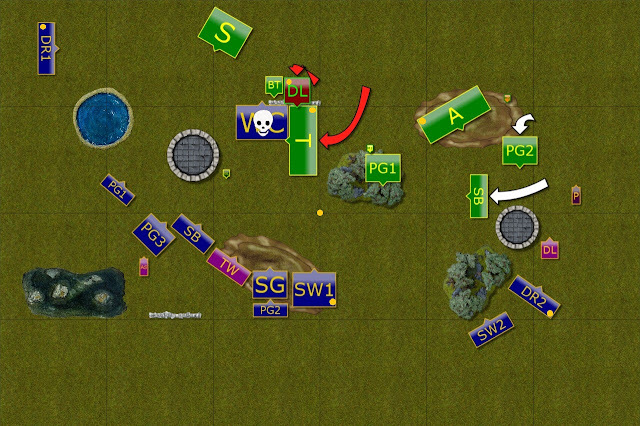 Unfortunately for the Outcasts, Palace Guard stubbornly held its ground and Elves kept control over the objective. Thanks to that the battle ended up in a draw! As expected, added Regeneration for Tallspears and Palace Guard regiments made them much more resilient. I think it is a very useful formation for Elven armies, especially with added abilities of Green Lady. Looking back at the game I concluded I could have done quite a few things differently. The first is to keep Windborne cavalry alive because I really needed them in the last turn of the game! I made a mistake of exposing them to the Silver Breeze fire and I was quickly reminded that troops can be routed quite easily, even with the inspiring hero nearby. Speaking of Windborne, one element I noticed is that I used their special ability to inflict damage since their shots are not affected by cover. However, that led to another mistake where I pushed the Tallspears back and in doing so, I enabled their charge against my War Chariots. What I should have done instead was to fire at the Dragon and push it back so it could not charge my unit. It would have kept the War Chariots in the game for longer and would have allowed them to contribute a bit more to the overall result. 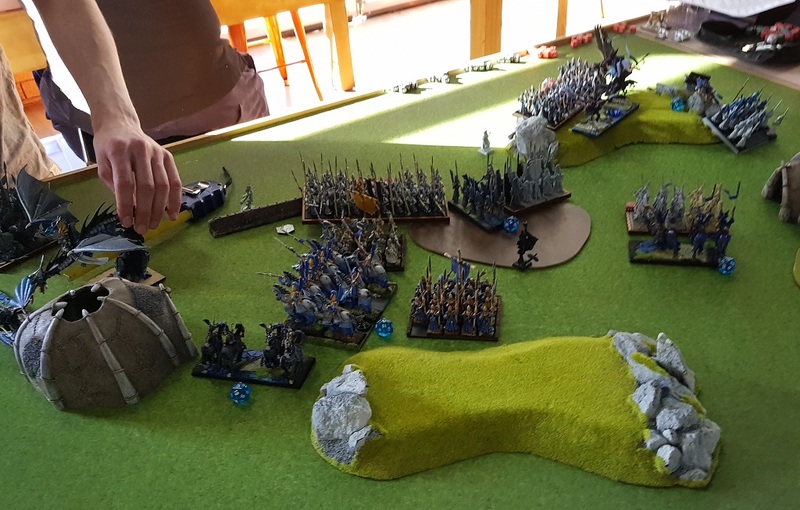 I was happy with the situation on the right flank and that I managed to deal with the threat of the Archers. Perhaps I should have moved towards that side one turn earlier so that I could have been in charge range quicker. At some point I decided to go for an exchange and attacked the Dragon Lord. I hoped Drakon Riders would have a chance to survive but the odds were not that good. What I should have done was to fly over Storm Wind and next to the Dragon and land behind enemy lines. Yes, the Dragon most likely would have been able to breath fire at Drakon Riders. But there was higher chance of survival of this attack. At the same time it may have given me better opportunities to win the fight for the center. In the end, the main thing was that thoroughly enjoyed the game, had a chance to play against new player and hopefully encouraged him to come back for more games at the future events!